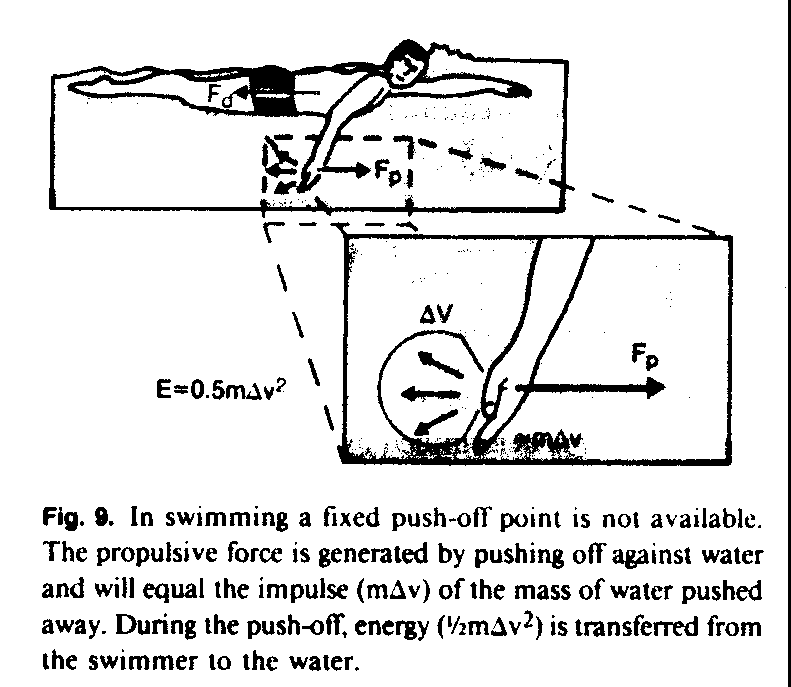 Knowledge of biomechanical parameters of swimming allows the identification the essential elements of motor control which are required to analyse movement aberrations. Such movement anomalies may result in pain or be the result of pain. Common injuries pertain to the shoulder and neck. Over-reaching can result in impingement of the supraspinatus tendon as well as acromioclavicular problems. Dropping or excessive anterior translation of the humeral head may mean long head of biceps dysfunction, reduced power with internal rotation and potentially suprsapinatus,infraspinatus and subscapularis issues. Scapula setting and motion of the scapula over the ribcage are of paramount importance for shoulder (glenohumeral) function. Scapula muscles such as the serratus anterior blend with the external oblique abdominal muscles, whereas the latissimus dorsi (superficial frontal myofascial train of the arms) blends with the thoracolumbar fascia and hence the mechanical pull of the fascia over the buttock muscles (superficial back myofascial train). Together, these anatomical relationships provide evidence for the importance of trunk stability and mobility (e.g. butterfly and breast stroke associated with trunk flexion - extension, freestyle asociated with rotational stability) on shoulder function. Aberrations in shoulder movement such as excessive abduction and flexion can result in counter movement in an equal but opposite direction of the contralateral leg. 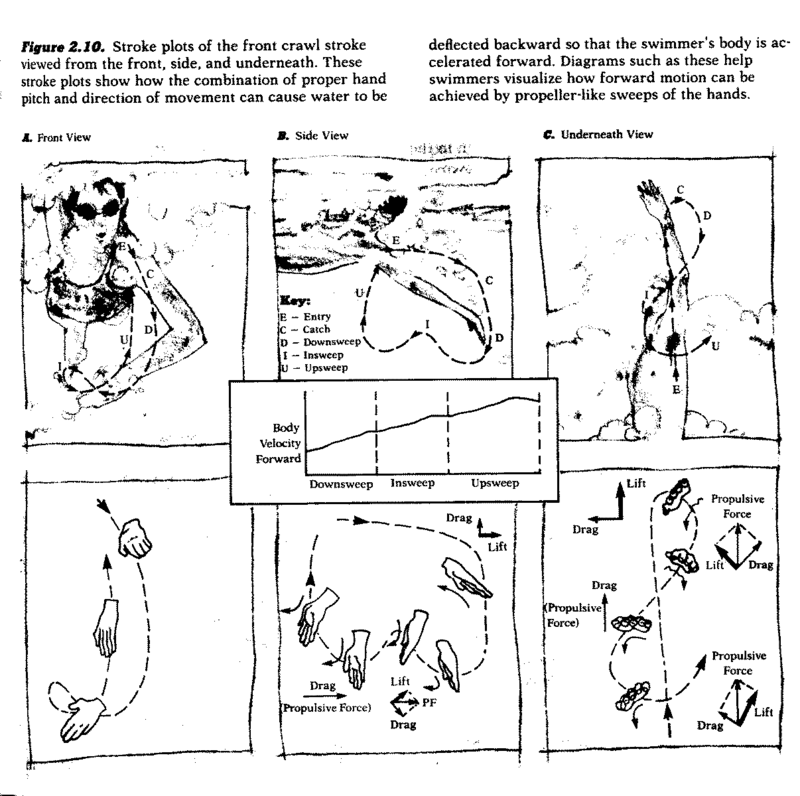 Poor scapulothoracic mobility (due to thoracic kyphosis) results in poor hip extension and hence excessive 'drag' of the legs in the water whilst kicking, as the inclination of the body moves from the horizontal towards the vertical. Engage lateral breathing of the lower chest wall, as this will allow the diaphragm to reach it's full potential and enable the transverse abdominis to work synchronously as a low back stabiliser. Recently, it has been proposed that lateral breathing can increase soft tissue compliance as well as improve blood flow to areas being stretched and exercised. Therefore, an aim of the Swiss Ball exercises may be to increase thoracic spine mobility. Importantly, therapeutic exercise may need to be performed prior to a Swiss Ball regime, as the global mobilising muscles should not take on the role of tonic stabilisers. The role of tonic stabilisation should be confined to the deep hip and back muscles. Hence, an aim of the Swiss Ball regime may be to increase the efficiency of the global muscles by teaching them how to switch on and off. Ideally, recruitment of the global muscles for endurance training should be below 70%MVC. If the subject recruits too much then the relaxation time will increase, which will then alter the timing of contraction between all the muscles. Good form is critical to performance. The deep stabilisers (eg transverse abdominis, iliacus, medial psoas major, piriformis, obturators) are low threshold endurance muscles that are recruited at 10-20%MVC. Control in a more stable configuration needs to be achieved before there is progression to the Swiss Ball.